Bobby Maines and his granddaughter put a tree through the ‘baler’ for customers. These trees are some of the last they will be selling of the season, and are going to customers who have been coming to the Maines’ for 15 years. On the weekend after Thanksgiving, you’ll pass countless cars topped with precious cargo: Christmas trees, precariously strung to the hood. The iconic trees support so many family traditions. It’s hard to imagine Christmas without them. But even icons can suffer economic whims. And this year, there is a shortage of Christmas trees. The causes of this have deep roots, going all the way back to the Great Recession. Maines Tree Farm in Alleghany County, North Carolina is a testament to this trend. In years past, the farm was thick with trees, making it easy to get lost within rows of tall frasier firs. But by the first of December this year, the ground was close to bare, spotted with tree stumps and thick grass. The chickens roaming freely around the Maines family house now have a clear view of the customers trekking up and down the rolling hills. The farm is officially sold out, though the Maines’ will still allow customers to come hunt and chop a tree down if they can find a suitable one. The Maines’ farm is almost completely bare of trees after this season. Approximately 60 acres, they used to have 60,000 plus trees. The Maines planted their first seedlings in 1989, making the switch to trees when dairy prices dropped. Both Judy and her husband Bobby, 71, grew up on farms in North Carolina before continuing the farming legacy together. One of their sons, Tommy, 40, now lives and works on the farm with his own family. Tommy’s two young children spend their free days with their grandparents, cutting down customer’s trees and driving tractors. The industry-wide shortage is affecting the prices of trees everywhere, showing an overall 5 to 10 percent increase over last year. This trend of rising costs has been happening for a while – the National Christmas Tree Association reports that in 2008, the average tree cost $36.50, which jumped to $74.70 in 2016. When the recession hit in 2008, there was an oversupply of trees on the market, with fewer buyers. In response, many farmers planted fewer trees, or even left the business. Because it takes years for trees to reach the heights people want for decorating, the downturn is now affecting the market a decade later. Small farms were more likely to plant the same number of trees as they did previous years despite the recession, while many of the bigger industrial farms cut back, farmers say. Thus, many of the small farms are experiencing more demand, which is why many are selling out so fast this year. “Our neighbor closed because he ran out out trees, so we got some of his customers and that’s why we sold out,” said Judy. According to GWD Forestry, a company focused on forestry investments around the world, the shortage began last year when growers started cutting into their 2017 allotted trees to satisfy 2016 sales. That trend will only exacerbate the issue in future years. GWD Forestry predicted that some preferred size availability would be down by as much as 40%-50%. They also think that the shortage will last until 2025. In the Maines’ case, they’re not only selling out this year because of higher demand, but also because they couldn’t find enough seedlings to plant a decade ago. She attributes this to planters leaving the business, as growing seedlings is hard work. They must be transferred to different beds for the first couple of years of their life, and many don’t survive to be transplanted to a farm. Once they get to the farm, the hard work doesn’t stop for farmers. Although technically retired, Bobby spends most of his days working on new seedlings the Maines recently planted. Even on their small farm of 60 acres, he must hire additional help on the farm to do what he no longer physically can. Owens gives direction to workers as he conducts his days. This year, he shipped trees to South Carolina to follow them through a stereotypical routine that wholesale trees go through, to see the effects of some of his projects. Tree farmers must carefully tend to the trees, shaping them as they grow into the iconic shape. A tree is personally cared for at least 100 times in its lifetime, according to NC State’s Research Extension program. Trees grow at the rate of about a foot per year, meaning the average tree must survive about 10 years of pests, storms, droughts, wind and hail on the farm to be at the height most people want when finally going on that trip to choose their tree. The Maines family will take a well deserved break after this season, and wait four or five years while their younger trees grow. Around their bare farm, little seedlings planted neatly in rows are already about a foot high and growing. The longer term viability of the Maines’ farm is not only dependent on how fast their trees grow. Once he decides to permanently retire, he’s going to need someone to take over in his farm. These are boots Tommy plans to fill. This is an issue that many farmers struggle with, as fewer and fewer children want to take over family farms. But it especially impacts the Christmas tree industry, where the turnover rate for the crop is about 10 years. Almost 22 percent of growers have been growing trees for over 30 years, according to an article written by Christmas tree researcher Jill Sidebottom. Farmers leaving the industry also leads to other consequences. According to Owens, many tree farmers have sold their smaller farms, leading to a consolidation of land. The USDA Census of Agriculture reports that there were 302 one to two acre farms in 2007, which lowered to 272 in 2012. Meanwhile, there was an increase of 107 farms that were 20-49 acres from 2007 to 2012. While this doesn’t seem like a huge difference, it does make an impact. In North Carolina, there are about 1,370 farms producing 40,352 acres of trees in 2012, according to the last agricultural census. These trees have a significant impact on the counties they are grown in – mostly Alleghany, Ashe, Avery, Jackson and Watauga. While the production of trees is mostly wholesale, there are over 400 choose-and-cut tree farms like the Maines’, selling more than 250,000 trees. This has a retail value of over $5 million – not including other products such as wreaths, roping and centerpieces, according to Sidebottom’s article. 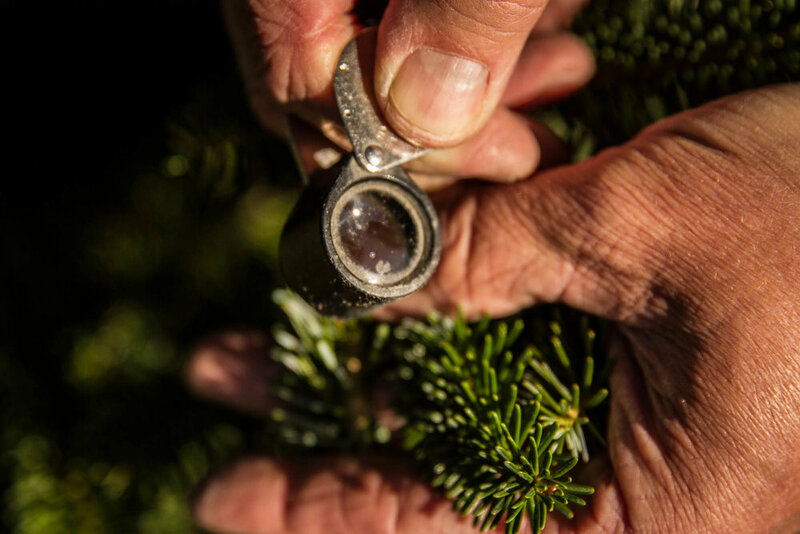 Owens examines a Christmas tree through a pocket magnifying glass, looking for a specific type of pest. These pests control where the trees can be shipped and sold, as well as how the tree looks. This money goes far in the local communities as well. It is estimated that every dollar earned by growers cycles as much as 2.5 times in local communities, and the trees keep much land from being developed. Even if one doesn’t drive to a choose and cut place in the mountains, it’s easy to see the trees affect other economies. Precut pop up shops can be in many places, and still provide a fun atmosphere for the family tradition. These trees must be packaged and shipped across the country. According to the North Carolina Christmas Tree Association, North Carolina is the second leading exporter of Christmas trees, following Oregon. That’s over 19% of the real Christmas Trees in the US. The industry is valued at $134 million in North Carolina, according to Sidebottom. A view from the Upper Mountain Research Station in Ashe County, North Carolina on November 20, 2017. This is where Jeff Owens conducts most of his research on Christmas trees, which is then used by farmers in surrounding areas. That is where some of Owen’s research comes in. Constantly juggling multiple projects, he looks into the best ways to ship trees in their pallets, the best ways to keep the needles on the trees and how to keep the trees looking fresh for longest, just to name a few. Walking up to his research facility, which is through the NC State Extension program, one is struck by the simple beauty of the quiet area surrounding it. In an old barn, there are multiple trees stacked together, some ready for shipment, some going nowhere. Black tarp hangs in the corner, left over from a recent experiment that necessitated a makeshift, air-tight chamber. In the barn, one finds envelopes stuffed with branch clippings, and a dusky stall full of branches. The trees Owens uses are survivors of past experiments, growing in a dilapidated clump on the next hill over. Envelopes stuffed with tree clippings are kept in a drying oven in the Upper Mountain Research Center. After drying out the clippings, they can be weighed to discover water content, which Owens uses in his research. Owens research is important to the shipment of trees, and the industry at large. Some states have put restrictions on the trees they get, making more organization and research necessary. For example, Florida will not allow the import of trees that have been infested with a particular kind of pest. Growers must keep this in mind as they ship their trees. Luckily, the Maines’ have inspired enough loyalty in their customers to keep them coming back for more. A family sips complimentary hot chocolate and plays with their dog as they wait for Tommy to secure their tree ton their car. The Maines have recently planted seedlings, as shown here. They will have to wait 4-5 years for these seedlings to become the height that most people want for decorating.